Legitimate Work at Home Job Leads – and Where to Find Them! Today a growing number of companies are hiring home-based workers to work in part-time and full-time positions thanks to the internet and a shift from the traditional 9-to-5 office jobs to more flexible working arrangements. More and more people are looking for telecommuting, freelance, and remote work at home job opportunities these days. There are many sites dedicated to providing a wide variety of work at home jobs for these people. 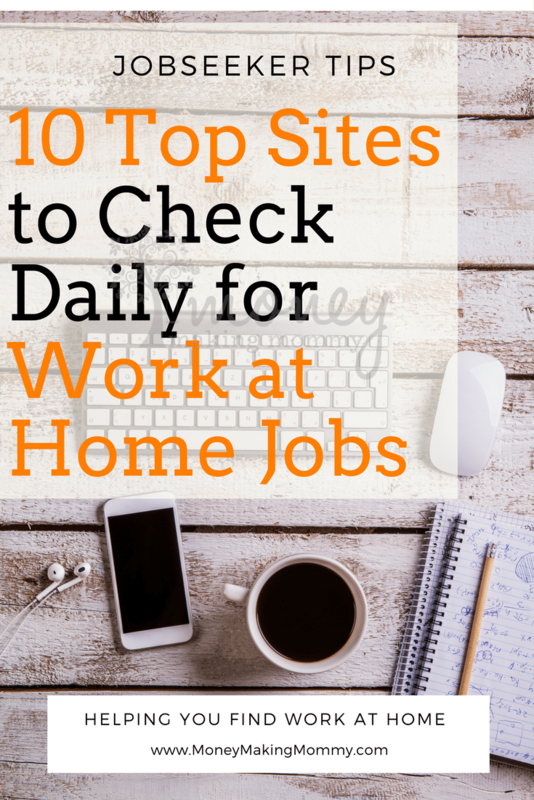 Here we look at nine top sites to check daily for work at home jobs. FlexJobs is one of the largest online job sites to check daily for work at home jobs. This site researches each job carefully and then validates the company offering the job before posting it on the website. FlexJobs filters through tens of thousands of jobs posted across the web in diverse industries and then hand-screens each job and validates the company offering the job before listing it on the site. All jobs posted on FlexJobs are legitimate and authentic. One disadvantage of using this great site is that the site is designed for paid members to apply to jobs except for access some listings for free. However, a paid subscription which starts at $14.95 for one month is worth the money because it gives you access to unlimited hand-screened, scam-free remote work at home jobs, telecommuting jobs, part-time and freelance work. You can create your profile that potential employers can view. You can also upload your resume and samples of your work, and more. This is a highly recommended work at home jobs site for anyone looking for genuine work at home jobs. If you are not satisfied with service the site offers, you can simply cancel the subscription and request a refund within 30 days to get a refund for your most recent payment. I personally use FlexJobs, so it's MoneyMakingMommy.com recommended. Virtual Vocations is a great site that provides hand-screened work at home telecommuting jobs ranging from entry to executive level in a wide range of categories. Whether you are looking for supplemental income, are a full-time working professional interested in telecommuting, are a parent seeking some form of telecommuting or virtual job with flexible schedule, are a student looking for a part-time job, are a retiree looking for additional income, Virtual Vocations offers a wide range of telecommuting and virtual jobs that you can do at home. Many top large, reputable companies or employers hire on Virtual Vocations. All jobs listed on this site offer some form of telecommuting or virtual work and real pay for real work. You can browse the jobs by category date, or by performing a keyword search in your area of expertise and view the most relevant job(s) available. It is free to register an account on the site. Free registration, however, gives you access to only limited hand-screened job leads. Paid subscription options give you unlimited access to all work at home telecommuting and virtual job leads. The site offers three different subscription options: monthly subscription starting at $15.99, 3 month subscription for $39.99 and 6 month subscription for $59.99. If you are not satisfied with service the site offers, you can simply cancel the subscription and request a refund within 30 days to get a refund for your most recent payment. We Work Remotely is the best place on the web to find work at home jobs designed for the most qualified people. All jobs posted on this site are not restricted to any particular geographic area. While there is not much information available about the site itself on the site, the jobs posted on the site are designed for highly qualified people. Jobs that you can do at home remotely are available in a variety of categories, such as programming, business/exec & management, development and system administration, marketing, customer support, designing, copywriting, and more. Upwork is the largest freelance site where you will find a wide variety of freelance jobs being posted on the site daily. These are jobs that can be done remotely and from the comfort of your home or anywhere with access to an internet connection. However, the competition is fierce because freelancers from all around the globe compete with each other on this site. Just sign up for an account and complete your profile, listing all the relevant skills, and providing as much information as possible regarding your education, employment history and certifications. Then the site will review your profile or application. If your application is accepted, you will be able to view and bid on jobs that interest you based on the category you have chosen. Craigslist is a very popular online platform on the web for buying and selling miscellaneous things. But, it is also a great source for work at home jobs, such as telecommuting jobs and freelance jobs online, or offline. Many people have landed their first work at home job through Craigslist. To find work at home jobs, just browse the site to search the city that you live in from the list to see if any job is available that matches your skill set. You can also select one of the major cities in your country to view the job listings available. If any job matches with your skills, apply to the post. You do not have to pay anything to Craigslist even if you have landed a job using the site. However, there are lots of scams on Craigslist, so beware of the scams. Apply to those jobs only that have been posted within the past 7 days. SimplyHired is a large job site that features tens of thousands of part-time and full-time local, telecommuting, online freelance, and work at/from home (any location, or remote) jobs. The site lists hundreds of new jobs every day in a wide variety of categories. Unlike some other jobs sites, you do not have to bid on jobs posted on SimplyHired. Just use the search boxes on the site to browse the site by job category/title, skills, or company and preferred location (e.g. city, state, ZIP, anywhere/remote, freelance, work at home, etc.) to get the most relevant jobs available. SimplyHired lets you find and apply to jobs that match with your skill set and preferred locations. You can find jobs in a wide variety of industries, such as writing, programming, designing, and more that you can do at home remotely online. Authentic Jobs is one of the most reputable job sites online for web designers, web developers, and creative pros. You can search jobs by job type, skills, location, levels, company type and salary/compensation to view the most relevant jobs available. Job seekers do not need to pay anything to apply for jobs on the site. Authentic Jobs is one of the leading and most trustworthy online job boards used by many of the world's leading companies or employers, such as Apple, Facebook, HP, Booking.com, and more to hire creative professionals. If you have the relevant skills, this is a great site to find tech related jobs. MediaBistro is the leading jobs site on the web to find remote work at home jobs in the media industry, in particular. However, this site also features work at home jobs for writers, editors, web developers, social media marketers and professionals in other creative areas. Job seekers do not have to pay any fee to apply to the jobs posted by clients on the site. While most of the jobs posted on this site are location-specific, you can browse jobs by entering keywords relevant to your skill set, area of your expertise and type of work, e.g. work at home jobs, to view the relevant jobs available. SkipTheDrive is great site for job seekers looking for remote employment opportunities. Jobs are available in telecommuting, telework, online, and remote work at home positions with both part-time and full-time opportunities. Browse the site to find remote work at home jobs and telecommuting jobs by category. The site is absolutely free for job seekers to use. Many organizations and companies, including Fortune 500 companies use SkipTheDrive to hire home-based workers. Of course, I'd be crazy to not mention my own website! Because my blog has been a work at home resource since 1999, I kind of know my way around the “work at home” block. I continue, after being a pioneer “mommy blog” to create and share work at home information and resources for my readers that is absolutely free. I provide insight, job leads, company reviews, money making ideas and so much more. But most of all, be sure to check out the Work at Home Job Board every day. Whether you are looking for some additional income or making a living from full-time work at home jobs such as telecommuting, virtual/remote freelance jobs, you could check out these top 9 sites, listed above, daily to find work at home jobs. You will have to create an online profile, upload your resume and samples of work (if you have any) to get started with most of the sites. Some sites are completely free to join and apply for jobs while others offer free registration and partial access to job leads. If you are just starting out, try the ones that do not require you to pay a fee to be able to apply for jobs. Thank you, Ms Kelly..for the emails over the years..and the time consuming work you do. Passing this on! Have a great day and rest of the week!